The trail immediately begins to climb while diverging slowly away from Fourteenth Road. It is well marked after the first 50 feet by yellow DEC foot trail markers. It proceeds to climb to the top of a small ridge and after about 0.5 miles affords views across a valley to another local hill. It then follows the ridge south east and descends into the valley in order to skirt around the south-east end of the local hill just viewed. It crosses the outlet stream of a wetland, contours around the hill, crosses the inlet stream and ascends to the col between that hill and the extended ridge of Moxham Mountain. 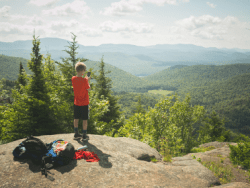 In the col, the trail bends left and ascends onto the lower portions of the Moxham ridge where at 1.3 miles there are a couple of open views of Gore Mountain to the south. Beyond this point the trail continues mostly up along the ridge so that by about 1.8 miles the imposing view of the south cliffs of Moxham Mountain come clearly into view. From this point on, there are excellent views from the cliff tops along the ridge as the trail ascends the last 300 feet to the summit and the top of the cliffs. While the ascent from the parking lot is only about 930 feet, counting all the ups and downs both coming and going, the hiker will ascend a total of almost 1500 feet. The trail maintains an easy grade most of the way with a few short stretches with a moderate gradient. 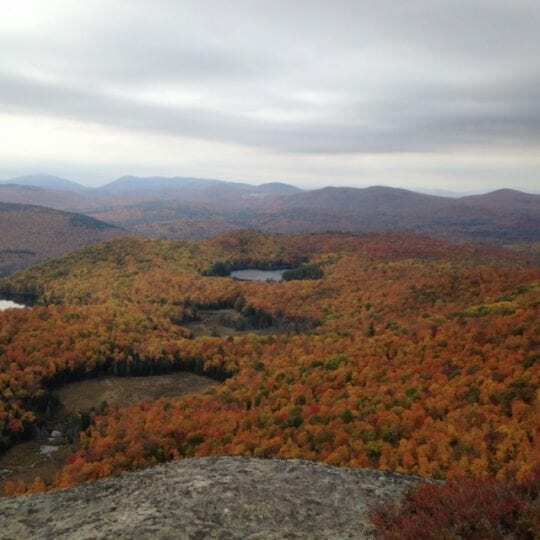 The summit affords the hiker views of Gore Mountain and Mud and Clear Ponds to the south, Crane Mountain to the south east and on a clear day Snowy and Blue Mountains to the west. Trailhead Location: Moxham Mountain Trailhead is located along Fourteenth Road. (43.7703°N, 74.0136°W). 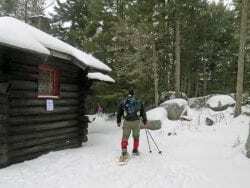 Featured trails are recommended by DEC. 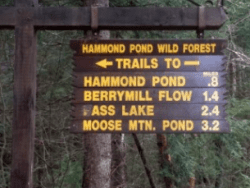 Description by Adirondack Mountain Club. Photo from Moxham Mountain by Tracy Ormsbee. Did this hike the summer before last and really enjoyed it. Definitely felt the extra elevation gain from the ups and downs on the way back down, but the grade was never steep and the views were definitely worth it! Please include better directions. Where is Fourteenth Road? What town? First hike I did after retirement in 2012. Done it every year since during the second or third week of December. BTW – how Moxham got its name is both interesting and tragic. Know the story? It goes back to before Colvin with roots in Clinton County.